Police should review witness protection protocols, a coroner has said in her report into the gangland killings of a Lincolnshire couple. Joan and John Stirland were murdered at their home in Trusthorpe in August 2004 in retaliation for a shooting by Mrs Stirland's son. Karon Monoghan QC's report suggests all officers be given witness protection training to prevent further deaths. The Stirlands fled Nottingham after shots were fired at their former home. In February, an inquest jury heard how Mrs Stirland's son, Michael O'Brien, had killed a friend of a member of the notorious Gunn family, headed by crime boss Colin Gunn. Mrs Stirland, 51, and her 55-year-old husband fled to Trusthorpe eight months before their deaths after shots had been fired at their former home in Carlton, Nottingham. Nottinghamshire Police knew the couple were a target but the inquest heard how Mr and Mrs Stirland should have been given witness protection. The jury also heard how crucial intelligence about the threat was kept secret in case it was leaked. In the report, Ms Monoghan called for rigorous reviews by both Nottinghamshire Police and national policing agencies into the protection of vulnerable witnesses. She wrote in the report: "There were significant flaws in the approach adopted towards Mr and Mrs Stirland, both in relation to witness protection and in relation to protection and care generally." Ms Monoghan also recommended police should look at whether witness protection should be handled by an independent agency. 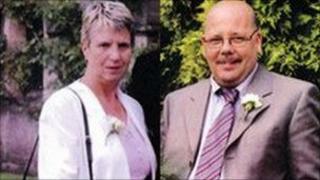 At the inquest, the jury found Nottinghamshire Police failed to share with their Lincolnshire counterparts, or properly act on, intelligence about the threat posed to the couple by Gunn's gang. It also said the investigation into the shooting at their home in Nottingham was flawed, there was no proper risk assessment of the situation and the response to reports of a prowler in the days leading up to the murders was inadequate. The unanimous verdict also found that BT operators contributed to the couple's death by passing on information about them to Gunn and his associates.